Home Headlines & Breaking News Rav Cohen On Tiveria Mayor Kobi: We Must Daven For Him! Rav Cohen On Tiveria Mayor Kobi: We Must Daven For Him! 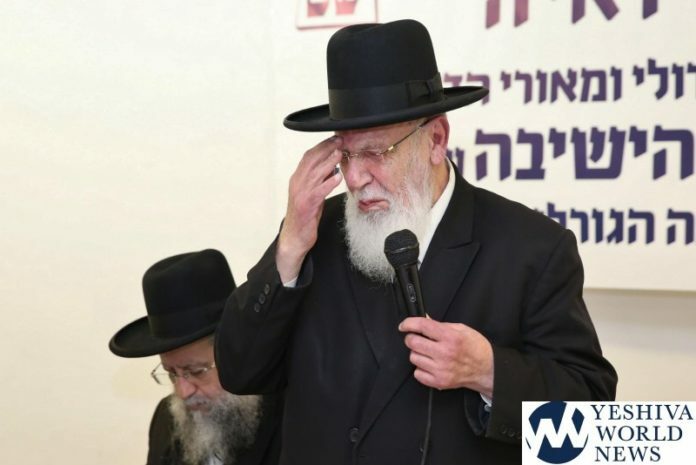 HaGaon HaRav Shalom Cohen commented on the strife taking place in Tiveria following the election of Ron Kobi, who ran on a vehemently anti-chareidi ticket. As the city’s chief rabbi, HaGaon HaRav Moshe Tzvi Buchbut continues his efforts to prevent the growing Chilul Shabbos in the northern city, Rav Cohen joins in, instructing the tzibur to be mispallel for the mayor, who promises to begin running public transportation in the city on Shabbos R”L. HaGaon HaRav Cohen was updated on the difficult situation in Tiveria today, and the uphill battle Rav Buchbut faces and the mayor’s office is doing its best to promote Chilul Shabbos. The rav added that the mayor’s ancestors were great rabbonim, asking “how does such a person come from them,” adding, the Chachamim have instructed us to be mispallel for descendants and their descendants and we must be mispallel for them from the depth of our hearts”. This is the proper approach. Not vituperation or curses, but hoping for the misguided one to do teshuva. If enough people appeal to him, perhaps he can change his mind. But that only works if people are menschlich about their disagreements, and don’t throw stones or burn garbage cans or spray-paint nasty slogans. May the rabbi succeed in his efforts.